Any soldier knows that a lot of campaign life is spent in waiting. In a Napoleonic army you might wait while the army forms up for the march or battle, or when the way is obstructed, or simply waiting for the enemy to make the first move. It can be a boring or an anxious time, and Strelets have already made several sets of such men at different points in history. This time it is the turn of the Highlanders under the Duke of Wellington. As usual half the poses are of the men in various relaxed poses, all ready for action and with their firearms, but not actually doing very much. All of them seem perfectly reasonable, and generally pretty natural too, although our eye was caught by the fourth man in the top row. 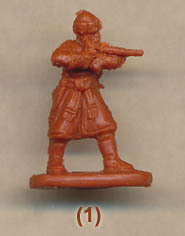 He seems to rest his chin on the muzzle of his musket, which might seem natural but surely entails some risk. Muskets could and did sometimes go off unexpectedly, and it was quite possible for the weapon to be loaded without the man being aware of it. Pointing such a device at your own head seems like a reckless disregard for your own safety, but perhaps that is a modern view and something to which the soldiers of the day gave little thought. The remaining poses are made up of command figures – two pioneers, two musicians and three officers. The two pioneers both have axes in hand but are clearly not using them. Since they are not cased we must assume they expect to use them imminently. The two musicians – one with drum and the other with bagpipes – are not playing them at this time, but just standing. The sergeant, ensign and officer are equally static, and as such are fine given the name of the set, an observation that applies to every pose here. The uniform of the men is much as it was for the greater part of the Napoleonic Wars, but every man carries a mess tin on his pack, which strictly speaking limits these men to 1813 or after, when this item was introduced. All aspects of the uniform are correct, and warrant no particular comment for those familiar with it. All the men are without a peak on their bonnet, and all but one have the feathers stuck into it. The one exception, the first pioneer, wears the bonnet ‘hummel’ style, i.e. with no feathers, revealing the woollen Tourie on top. In fact many men may have worn their Kilmarnock bonnet this way on campaign, so this figure is appropriate, particularly if you are going to wield an axe soon. Both pioneers wear aprons, and the sergeant has his sash across the chest. The officer has elected to wear breeches rather than the kilt, which might indicate he is mounted, though not necessarily. He also wears the common Highland Scarf. The men are in full kit, with cartridge pouch, haversack, water bottle and bayonet scabbard from various crossbelts. All also wear the square pack with rolled blanket on top, plus the aforementioned mess tin. Once more Strelets has given all the packs external side pockets, which is wrong, and they have also given the same kit to the pioneers, yet no cases for the axes nor room to carry them. Swords are carried by all musicians and officers here, and both the piper and the ensign have chosen to wear their sporrans, which the ordinary men never did on campaign. One of the pioneers has a billhook on his waist, and the ensign looks to have a dirk on his, which makes sense. Some compromises have been made with regard to the larger items, perhaps to allow them to fit the mould. First, the sergeant’s spontoon is just over 2 metres in length, including head, when it should be more like 2.75 metres long. Second the flag, although nicely limp here, is considerably too small. It measures roughly 17mm square, which is about 122cm to scale. However the real thing was around 183cm by 198cm, so while the discrepancy in size is less apparent here, it is nevertheless much too small. The flag has no design engraved on it, which is good in our opinion, but has been given a very fat spear-head finial on what is also a rather undersized staff. All the men appear to have wings on their shoulders, which means they are either grenadiers or lights, and other clues suggest they are grenadiers. Why the more common centre companies were not depicted we do not know, so some may want to trim these down in some cases. This is another set that demonstrates the progress Strelets have made with their standard of sculpting, although the extra pockets on the packs and the undersized spontoon and flag are still annoying. However the poses are excellent and while most of the figures in the box are ordinary privates you do get a good selection of specialist figures too. Still not as beautifully produced as the best in the market, but a very worthy set with plenty of uses for many.